Buddy Club Coilovers - Racing Spec MITSUBISHI - Pann Auto Performance - San Diego largest aftermarket automotive performance parts - What do you drive? Buddy Club Racing Spec Dampers are the perfect complete suspension kit with resemblance of P1 racing damper’s excellent designs while it is de-tuned for street – circuit use. However, the car specific pillow-ball upper mount design, proper spring rate, 15 level damper adjustment, and height adjustment capabilities accommodates driver’s requests. Buddy Club Racing Spec Damper Kits are a high performance sports suspension kit designed by engineers using a vast quantity of data that Buddy Club has accumulated in the past 15 years using its high performance aluminum damper (ie. 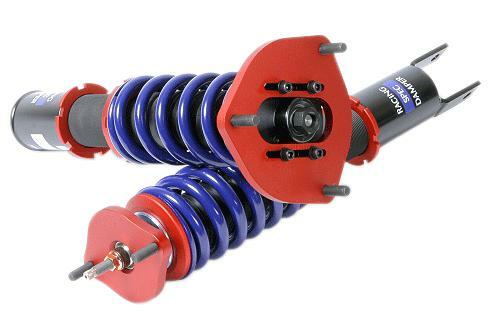 spec 30.1 Racing Damper) on various racing cars and tuned cars, focused more on the proper damper size, spring rate, dampening, stroke length for customer’s use in winding roads and race tracks. With an adoption of a “adjustable bracket” the ideal low position can be achieved without any use of helper spring. One rotation, approximately 2mm, will enable the user to change the length of the damper. Dampers are black plated rather then painted for extra durability. The 15 level adjustment corresponds to variety of racing stages, from Touge ‘mountain roads’ to circuits. Adjustment is easy with its click adjusting dial. The dial is located in the on the upper shaft for regular dampers or on the lower shaft for inverted dampers. This damper is also designed for street use; hence, dampening setting ranges from hard (+4kg/mm) to soft (-4kg/mm). Adoption of the single tube shell case enables the use of wishbone type 46 and strut type 36. This leaves extra space for larger pistons. Also this design allows for better heat dissipation which prevents performance deterioration from hard runs. Special steel and anti-friction components are used to minimize friction. Application of the upper pillow upper mount allows you to have greater handling response by minimizing upper chassis movement. Caster adjustment allows the correction of camber for further tuning ability. Each single full rotation equals a 2mm drop. The adjustable locking seat allows for spring stress to adjust without the necessity of changing suspension position. Tremendous enhancement in durability is a result from high quality surface processing and constant testing means we’ve found the perfect spring rates for each application.